For lovers of literature, Arthuriana, and fairy tales, this is a treasure trove. 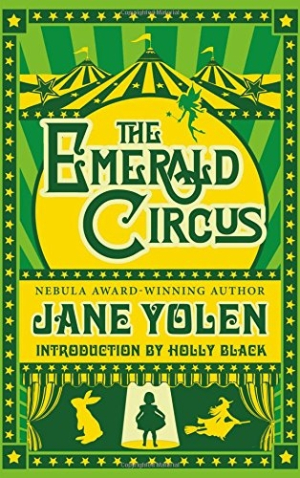 The Emerald Circus is a moving collection of stories that conveys timeless truths as it affectionately plays with traditional tales. Jane Yolen’s latest collection is a wonderful menagerie of twists on classic fairy tales, legends, and the lives of literary figures. These stories parade beneath a circus tent knit by the underlying theme of the power of art. Bookending the collection are two evocative yarns based on highly influential literary personalities. Hans Christian Anderson transcends his impoverished origins, encounters the real Snow Queen, and gains the admiration of children worldwide. Emily Dickinson is taken for a ride in an alien spaceship and discovers the connections that words can forge across differences. New reaches of beauty affect her poetry forever. Between these stories, a vast range of legends and fairy tales are deftly reworked. Lancelot seeks the hidden grave of Guinevere. A group of Wendys stage a feminist revolt against Peter Pan and the Lost Boys. The tornado carries Dorothy away from Kansas to join the Emerald Circus, where she becomes a talented acrobat. The origin of Excalibur resides on a mysterious island of women swordsmiths. Alice, without a vorpal blade, faces the Jabberwocky. A dying monk relates the events surrounding the birth of Merlin. Every episode is delightfully fresh and full of poignant insight. For lovers of literature, Arthuriana, and fairy tales, this is a treasure trove. The prose never fails to entrance, and the creativity on display impresses. There is an obvious depth of research and care, particularly evident in “The Jewel in the Toad Queen’s Crown,” a tale centering on Disraeli, the intriguing Jewish-turned-Anglican prime minister of Victoria’s England on two separate occasions. Notes in the back on each individual story offer a peek into the mind of the writer and give context for Yolen’s inspiration. These are interspersed with a few of her own poems, which are warm and inviting. The Emerald Circus dances at the border between bucking tradition and paying homage to the great stories and figures of ages past. The result is a brilliant assemblage of narratives with the potential to leave an audience spellbound.